Mobile Banking allows you to securely manage your accounts whenever and wherever you want. With Mobile Banking, you can use our intuitive, easy-to-read screens to access balance information, pay your bills, transfer funds and find nearby ATMs or branches using the browser on your mobile phone. 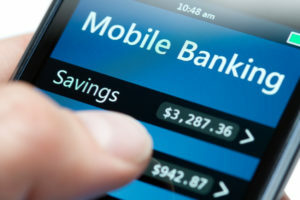 With Mobile Banking, you can bank with complete confidence that your personal information is protected by advanced encryption technology to prevent unauthorized access. We are also committed to protecting your privacy, so we will never transmit account number information. For smartphone users, our Apps are made specifically for your smartphone. They give you fast access to account information and use your phone’s built-in functions to provide a better banking experience. Our apps are supported by Android, Blackberry, and iPhone. For users who regularly browse the internet on their mobile phone, Mobile Website allows you to access account information and make transactions from your phone’s web browser. Optimized for mobile use, Mobile Website provides fast and easy access to your accounts.